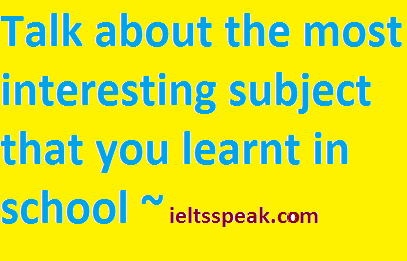 This is the 13th cue card in the series of IELTS speaking cue card. The name of today's cue card is "talk about the most interesting subject that you learnt in school". Why did you think that it was interesting subject? Who was the teacher of this subject? What types of subjects are essential in your country for children? During my schooling days, I learnt many subjects such as mathematics, science, Hindi, Punjabi, English and many other subjects like history at all. Since my childhood, I was good in my study, so I like all the above subjects. but in my opinion science was the most interesting subject that I studied and I found the physics the most interesting among all in the same subject. physics is That part of subject science where you can learn all about the mechanisms, things happening around you. such as how the fan works or how the light glows or how you even breathe, how your lungs fuse oxygen into the blood, how the kidneys filter blood. Moreover, it teaches you how your eye operates to your hearing, how the inner ear and the outer ear works. life is impossible without physics. physics Subject was taught to us by Mr Manjeet. he was a great teacher. He always brought apparatus to the classroom with all the prisms and the phenomena which he described it practically. so the subject became more interesting for us when we learned. even my father helped me at home by doing the practicals for which were not possible in the classroom. like how photosynthesis works, the things that we grew in our backyard, the plants and all. so physics helped me understand life in a better way. so this was the most interesting subject that I learned at school. Is math an important subject in your school? What technique do you use while studying for improving concentration? Is physical education interesting subject in your school? Note = please write all the answer of this questions in the comment box. Tags used- Talk about the most interesting subject that you learnt in school, Talk about the most interesting subject that you learnt in school, Talk about the most interesting subject that you learnt in school, best subject lines for email marketing examples, business email subject line examples, business school subject, business school subject crossword, ca multiple subject teaching credential, a single subject credential, ca single subject teaching credential, California multiple subject teaching credential, California single subject teaching credential online, ccna subject index, clear multiple subject teaching credential, Talk about the most interesting subject that you learnt in school.